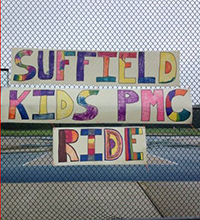 The 2019 Suffield PMC Kids Ride sponsored by First Suffield Bank will be held on May 11 at 10 AM at the McAlister School in Suffield. We can't wait for another wonderful day in support of the PMC and The Jimmy Fund. Our 2018 event was held May 12 and our announced fundraising total is $64,500, a new high for our event. That total has increased and we have now surpassed $251,000 in our seven-year history! It is hard to put into words what this event and the support we have received means to us and so many others. The smiles on the faces of our kids (and adults!) are all we need to see. As we continue to come together for this cause, we know the best is ahead of us. None of this would be possible without our committee, volunteers, sponsors, but especially our wonderful riders who work so hard to fundraise each May. Our can and bottle drive is always on, proceeds to the same cause. 10 - 11 am – RIDE! 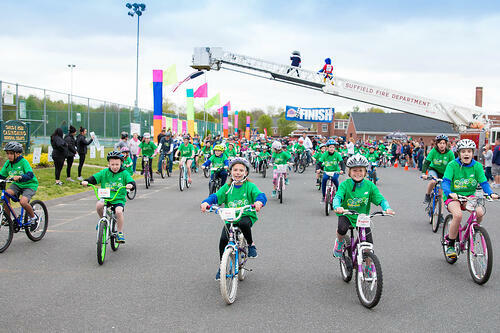 Tot Lot: Our younger riders can ride at the Suffield Middle School parking lot, in a closed off traffic circle with lots of volunteer supervision. Ride Course: Older riders can ride up Hill Street to Russell from the middle school, which is 2.5 miles each way. We have dozens of stationary and riding volunteers on Hill Street, which is only open to local traffic during the ride. It is up to parents to decide which course is appropriate for each child. We would like to thank the following partners for their generous support of the Suffield PMC Kids Ride. Please keep them in mind & support them throughout the year! Thanks to Our Title Partner The First Suffield Bank for Their Longtime Support! 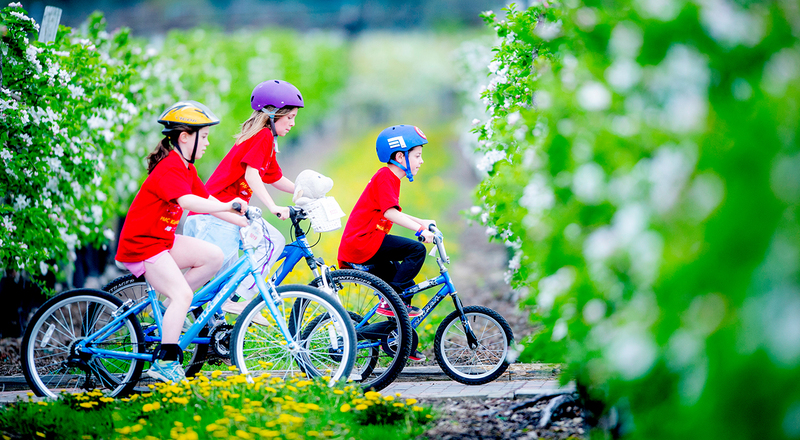 The Suffield, CT PMC Kids Rides relies on local sponsors to help keep costs low and so that the PMC can continue to donate 100 percent of every rider-raised dollar directly to Dana-Farber Cancer Institute. If you or your company are interested in becoming a sponsor or to donate items (pizza, ice cream, snacks, sporting tickets, gift cards, baskets, etc) please click on the button below.